Second grader Pierra Rozen-Nowac, daughter of Zissy Rozen and James Nowac of Miracle Mile, has been awarded the California 2018 Reflections Art Program Award of Excellence. Pierra’s entry in the primary division (pre-K to second grade), a picture of children in silhouette, was reviewed at local, regional, state and national levels. The artwork won at the district and national levels in Pierra’s category and division. 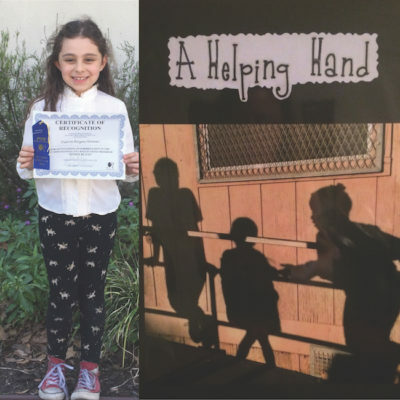 You can see her photographic entry titled “A Helping Hand,” as well as art by other award winners in the program, at 1605 W. Olympic Blvd., Ste. 405, Sun., May 6 from 10 to 4 p.m.
Pierra’s 13-year-old sister Nadya also won a Reflections award for excellence in photography for her division in 2015. The sisters both won awards in 2016. For more information and to see other winners, visit capta.org.